The Denel Group has given three young female engineers an opportunity to sharpen their leadership skills, build networks and get armed with practical tools to thrive in the Science, Technology, Engineering and Mathematics (STEM) field by attending a week-long programme for women in innovation in Kigali, Rwanda this week. “We are responding to the national priority to develop the next generation of engineers, artisans, scientists and researchers. It starts with exposure, excelling in STEM subjects, studying further in areas of critical and scarce skills and sharing relevant information with your peers,” says Vuyelwa Qinga, Group Executive and Public Affairs of Denel. 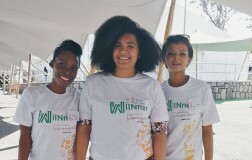 The three, 26-year-old Robin Nxele, a young scientist who holds a Master of Science degree in Chemistry, 24-year-old Amy Dove, a mechanical engineer and 29-year-old Mahlatsi Machete, a junior systems engineer, were selected to attend this programme as part of the Denel Group’s national youth month celebrations. “They were also chosen because our Shareholder, the South African Government, expects us to be responsive to our mandate to contribute to the socio-economic imperatives of our country, of which skills development is one of them. As a company, Denel is also committed to developing and finding new opportunities for our young bright minds. “Our aim is to contribute to the holistic education and development of young people and this also forms part of our Corporate Social Investment strategy where our investment focuses on STEM education and starts at the school level, to university, technical schools until they join the company. At times our beneficiaries get absorbed by the broader industry, but ultimately, South Africa benefits. This is part of continuously expanding our role in contributing towards the socio-economic objectives of the country which include training and development in critical and scarce skills, for the benefit of our economy”, says Qinga. The Kigali leg of the WiIN conference in Kigali had four sessions between the 5th and the 30th of June, with the three Denel engineers attending the last session from the 26th to the 30th June. It is positioned as a programme that supports young scientists and innovators through partnership with Next Einstein Forum (NEF) and the African Institute for Mathematical Sciences (AIMS).